Whether you’re new to wearing contact lenses or you’ve been wearing them since the days of old, hard lenses, it’s important to make sure that you are following the correct cleaning and handling procedures as well as the wearing schedule recommended by your doctor. There are lots of different contact lenses out there, and your doctor has recommended the correct type of lens, solution, and wearing schedule for your particular eyes and for your lifestyle. With that in mind, there are a few rules that all contact lens wearers should keep in mind. 1. Keep it clean. Specifically your hands. You should always make sure to wash your hands before handling your contact lenses. It’s equally important to make sure your hands are dry as well, using a lint-free towel to dry them off. If your hands have lotion or other creams on them, these chemicals can transfer to your contacts and then into your eyes allowing for irritation or infection. 2. Follow your schedule. Seriously. The schedule recommended by your doctor is not a mass conspiracy by manufacturers to get you to buy more contacts. The longer your wear your contacts means more protein build up and the higher likelihood of infection. Also, the lack of oxygen can disturb your eyes even further. Each type of contact lens is designed to be worn for specific time periods based on the materials it is made out of and the liquid content. 3. The Solution solution. We highly recommend that you use the contact lens solution that your doctor recommends. There are, of course, different types of solution; some solutions disinfect, some are good for storing, and some do both. Some contact lens solutions are made specifically for people with sensitive or dry eyes. At EyeCare Specialties, we offer several different kinds of solution that will help keep your contacts as clean, fresh, and bacteria-free as possible. NEVER CLEAN OR STORE YOUR CONTACTS WITH SALIVA OR TAP WATER. Bacteria breeds in both and can cause infection and other problems easily. Also, make sure to never reuse your solution. A good idea is to make sure you stock up or buy several bottles to store in different locations (one at home, one at work, maybe a travel size for the purse) so that you’ve always got one available. 4. Take the case. And clean it every once in a while. It’s a good idea to switch out your contact lens case every one to three months or so to make sure you have one that is free of contaminates. We recommend using the case that comes from your doctor, but if you do use a decorative one that you’ve picked up at the pharmacy or another retailer, make sure to thoroughly wash and dry it before you store your contacts. 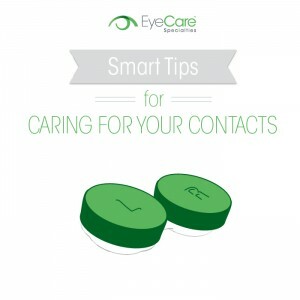 Of course, the main objective with the proper care, handling, and storage of your contacts is to make sure you have the healthiest eyes possible. If you have any questions at all, please contact your doctor or any of the EyeCare Specialties contact lens experts.